Why did you choose the YAMASORO office mesh task chair? Black mesh covers both the padded seat of the office conference chair, as well as the back of the mesh chair. In addition to lower-back support and border detailing, the gently curved back of the chair provides mesh-only sections for enhanced breathability. Simple pneumatic controls let you raise or lower your seat in your desk chair--or remain firmly sitting up straight. 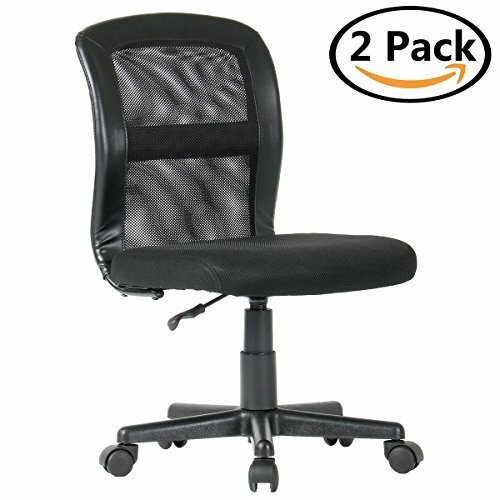 The adjustable mid-back office chair helps promote a comfortable seated position, which is important when at your desk or in front of the computer for long stretches of time. Upholstered by net fabric and Non toxic PU Leather material and filled by high density foam. Because this chair has a total of 8 screws. Of these, 4 long screws are used to install the chair's backrest, and 4 short screws are used to install the tray at the bottom of the seat. If the screw is used incorrectly, it will cause the screw of the backrest to stripped . Please correct installation! 【OFFER EXTRA COMFORT】- This work chair's abrasion resistant polyester fabric seat cushion and mesh back keep your body happy, supported and comfortable so you can concentrate on work. The simple office style which is perfect for meeting room,home, office or college dorms. 【Soft Mesh Back】- It gives relaxation to your back without feeling stiffness compared to other chairs. The material is soft and perfectly fits your body. 【BUDGET FRIENDLY】- These office mesh chairs offer excellence without expense so you can stretch your furniture dollar while working in comfort. 【EXCELLENT AFTER-SALES SERVICE】- Quality comes from decades of ingenuity and Tested & Certified Meets or exceeds all BIFMA standards.Any dissatisfaction with our products or service, please feel free to contact us. If you have any questions about this product by YAMASORO, contact us by completing and submitting the form below. If you are looking for a specif part number, please include it with your message.